The training is designed for those preparing for speaking in front of the camera and giving interviews. The training is designed for those preparing for speaking in front of the camera and giving interviews. It is a basic compendium of information on how to work with the media, speak in front of the camera and on the radio and carry out effective interviews. The workshop consists of three parts: vocal pedagogy, working with the camera and cooperation with the media. The training provides its participants with the skills facilitating in overcoming stress, controlling the course of an interview, inflecting the voice in order to make it more reliable and convincing. The participants will also learn how to avoid many common mistakes. 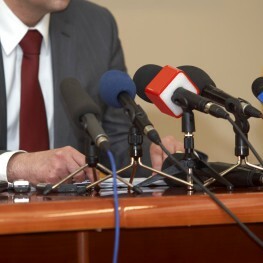 The training is addressed specifically to spokespersons and experts often requested to give an interview. The training includes practical exercises in radio stations and TV studios. Our lecturers are highly-esteemed journalists, theatrical actors and experts in the domain of media. The training lasts two days. Classes take the form of workshops and practical activities. The participants receive schooling materials in electronic and paper form, as well as a certificate. of completion.